Wellify (v.): to find self-acceptance and love what is. Often times, when training for a huge event like the Boston Marathon, it’s easy to become consumed by the physical aspects of the endeavor. The mileage. The course. The climate. The carbs. The injuries. We become so focused on the finish line that we lose sight of the start, what got us here in the first place. As the mileage increases, it’s important to remember that the race itself and all of the training is merely the effect. 26.2 miles, although accurate, is an extremely linear way to describe a marathon. The race, after all, inspires not just because of the distance, but because of the cause we have to run. It’s the stories of marathoners- the elite field as well as people like you and me- that make this event so special. That sense of purpose is essentially what gets us to the finish line. It’s the reason we everyday folk get up at 6AM each Saturday to train the hills of Newton. It’s why we manage to fit in 18-mile runs all while working full time, part time and all the time in between. It’s the justification we have for neglecting our loved ones until mid- April. It’s why we run. Now, in my third year of training for the Boston Marathon, people have called me crazy for continuing to “do these unnatural things to my body.” And I can’t say that they are wholly wrong! However, the experience of running has given me far more in benefits than in deficits, I can assure you, because it’s led me to the most compassionate, inspiring and incredible people I have ever encountered. One, a man with a prosthetic leg who completed his first marathon after losing his limb serving our country. Another, a cancer survivor who’d also lost 100+ pounds and ran to celebrate life. A man who used his one leg to push himself backward in a wheelchair for 26.2 miles in 90-degree heat. A man who pushes his son every year in a wheel chair to bring awareness to quadriplegia and cerebral palsy. A man who runs for his beautiful baby boy who has Down Syndrome. A woman whose battle with weight loss while raising 12 adopted children had miraculously led her to dream of qualifying for the Olympic Marathon. The thousands of charity runners who tirelessly advocate for their causes, runners who collectively raise millions of dollars to impact the lives of others. This is the spirit of the marathon. The feeling I get when I drive to Newton on Saturday mornings to meet with the charity coalition is that of excitement and honor. I find comfort in exchanging fundraising tips with my peers and humor in exchanging port-a-potty antics. And as I write this now, I am filled with pride to think that these runners are my teammates, my friends, who all strive to make a difference and who inspire me to be better everyday. In a world where there is so much attention drawn to the negative, I choose to think about positive change. I choose to think about why I run. And when I do, that 26.2 mile distance doesn’t seem so out of reach. I am trying to raise $15,000 for the Mass Mentoring Partnership. Will you help me? Every dollar counts! ← Icy cold breezes… and a snot that freezes. 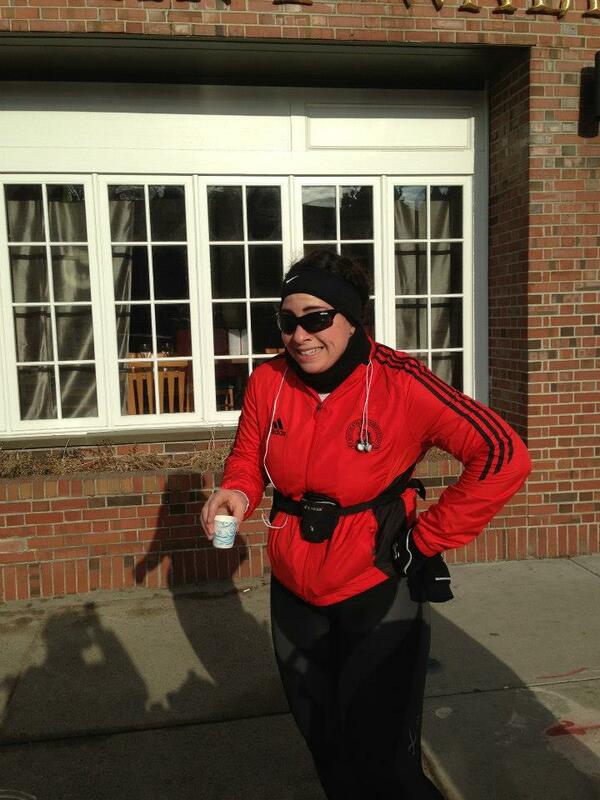 Follow me as I train for the 2013 Boston Marathon! The pain is only temporary. There is no I in marathon.